Kursty Groves is a design & innovation consultant, and presenter. Whilst researching this book, Kursty learned that even the most creative organisations still need to go off-site for inspiration and has since launched creative venue finder www.spacehopper.com. Kursty has also taken her experience to a wider audience through broadcasting. 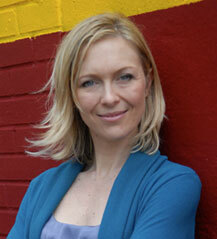 Her television credits include: BBC’s That’s Genius!, Young Foresight, Teachers’ TV and Channel 4’s Design Challenge. To learn more about Kursty, visit kursty.com.